Leading patent analyst ranks Ford above all other automakers for the quality and significance of its technology patents. DEARBORN, Jan. 28, 2009 – A new study by the world’s leading patent analyst, The Patent Board™, found that Ford Motor Company outperformed all other automakers in the quality and significance of its technology patents. “Ford’s patented technologies are closer to the cutting edge than its competitors,” says Christine Wren, director of business development for The Patent Board, which tracks and analyzes patents across 17 industries globally. Technological innovation is a core value at Ford as the company drives for leadership in quality, safety, fuel efficiency and in-car connectivity. For example, the 2010 Ford Fusion and Fusion Hybrid, which is America’s most fuel efficient mid-size sedan, have 119 patents, a record for Ford. The Patent Board recently issued its Top 10 Innovators in Automotive & Transportation Patent Scorecard™ for the fourth quarter of 2008, which ranks Ford above all other automakers in Research Intensity™ and Industry Impact™. Ford’s Research Intensity score, which is more than twice that of the industry average, indicates the extent to which its portfolio includes patents with strong scientific support. Similarly, The Patent Board’s Industry Impact score measures the broader significance and impact of a company’s patent portfolio across the industry. This indicator analyzes how other patents build on Ford’s innovation by looking at patent-to-patent citations. “Ford’s overall patent portfolio plays a significant role in serving as a foundation for other technology innovation as shown by receiving 20 percent more citations than the average portfolio in this industry,” Wren says. For the Fusion Hybrid, for example, teams of research scientists and engineers developed Ford-exclusive technologies that helped the vehicle achieve a certified 41 mpg in the city, 8 mpg better than the Toyota Camry hybrid. Patents on the Fusion Hybrid pertain to technologies such as Ford’s new-generation hybrid powertrain and SmartGaugeTM with EcoGuide digital instrument cluster that helps coach drivers to achieve better fuel efficiency. “We focus on getting high-quality patents that have the best breakthrough potential for the company,” says Bill Coughlin, president and CEO of Ford Global Technologies. 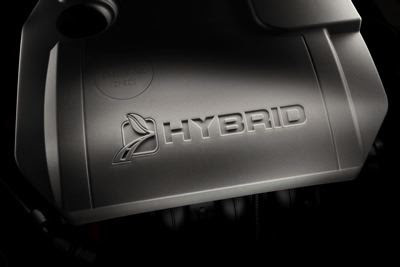 Hybrid technology – The Fusion Hybrid’s powertrain system combines the best attributes of the gasoline engine and electric battery-driven motors to deliver the optimal experience for the customer in terms of driving performance and fuel economy. The overall system upgrade allows the hybrid to operate up to 47 mph in pure electric mode, approximately twice as fast as some competitors. The city driving range on a single tank of gas is expected to be more than 700 miles. 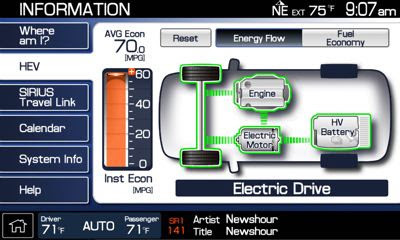 SmartGauge™ with EcoGuide – This unique instrument cluster helps coach Fusion Hybrid drivers on how to optimize performance of their vehicle for maximum fuel efficiency. It features two, high-resolution, full-color liquid crystal display (LCD) screens on either side of the analog speedometer that can be configured to show different levels of information, including fuel and battery power levels, average and instant mpg report. Blind Spot Information System (BLIS™) with Cross Traffic Alert – Ford’s new Cross Traffic Alert feature will help warn drivers of impending traffic while backing out by using radars to pick up moving objects within a 65-foot range from either side of the vehicle. Two warnings are given: an indicator lights up in the corresponding outside mirror and an audible alert is sounded. The feature works in conjunction with Ford’s radar-based Blind Spot Information System, utilizing this system’s two multiple beam radar modules, which are packaged in the rear quarter panels – one per side. The radar identifies when a vehicle enters the defined blind spot zone and illuminates an indicator light on the corresponding sideview mirror providing a warning that a vehicle is approaching. EasyFuel™ Capless Fuel-Filler System – This industry-exclusive feature eliminates the need to touch dirty gas caps and helps to reduce evaporative emissions that create smog. When fueling is completed and the fuel pump nozzle is removed, the system automatically seals shut. Patenting is a global activity at Ford, with experts in the United States, Europe, India and China sharing common processes and reporting through Ford Global Technologies, LLC, a wholly owned Ford subsidiary responsible for managing Ford’s intellectual property worldwide.